Punxsutawney, a close-knit borough in western Pennsylvania, was bustling with trade and commerce when it gained worldwide prominence as the "weather capital of the world." Adopting an old-world custom brought here by German settlers, the community staged its first groundhog pageant on February 2, 1887, and in years thereafter nurtured and defended the legend until it took root. Around Punxsutawney includes much more than the story of Groundhog Day. It shows Punxsutawney emerging as the trade center for the numerous coal mining settlements that developed around it. Pictured are the ironworks that sprang up early in the twentieth century and the woolen, silk, and hoop mills that followed, the brickworks, the breweries, and the host of hotels—all of which transformed this small valley town into the largest industrial center in Jefferson County. Also depicted are the coal communities, such as Walston and its 700 coke ovens—the largest string of such ovens in the world—that lit up the sky with their nightly glow; the Pantall Hotel, with its authentic Victorian bar where the diamond trade is said to have flourished; and the Public Square, one of eight original squares laid out by the founders. Local author Sr. Anne Frances Pulling has written five other Arcadia books: Around Cresson and the Alleghenies, Around Central Islip, Babylon by the Sea, Windmills and Water Mills of Long Island, and Northern Cambria. 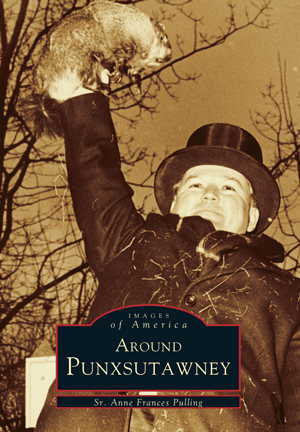 For Around Punxsutawney, she has woven stunning images and interesting details into a fascinating account of this industrial town, with its spirit of camaraderie and its unique midwinter heritage.